Have a question about egg safety, handling or preparation? We've got answers. The Egg Safety Center represents commercial egg producers, which follow the FDA Egg Safety Rule and state/federal regulatory programs. What is a double yolk egg? How are they formed? 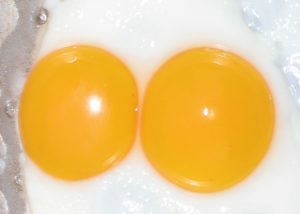 A double yolk occurs when a chicken releases two yolks into the same shell and are usually produced by young chickens whose reproductive systems have not fully matured. Double yolks can also come from older chickens nearing the end of their egg producing period. Eggs with double yolks are perfectly safe to eat. Some say it’s a sign of good luck to fine them! The chance of getting a double yolk is said to be 1 in a 1000 but this is dependent on the age of the flock. It is possible to get more than one double yolk egg in the same dozen.